As it tours, Kooza is not able to do what Cirque’s Vegas shows can and show off with big-budget installations – like the zillion-gallon water tank for O. Kooza has always been a tourer, never staying put longer than about three months in one location. It tours with a huge big top – except for indoor residencies such as the Royal Albert Hall. 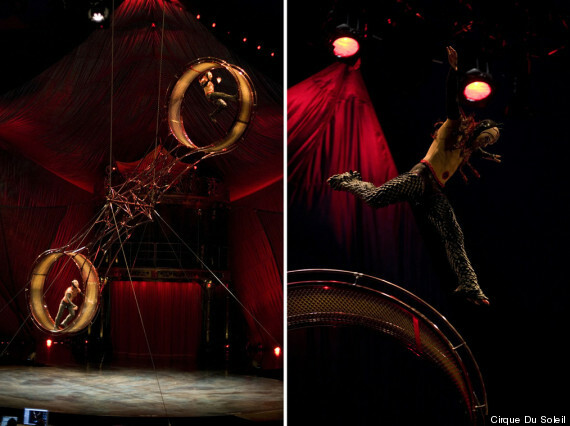 After premiering in Montreal (home of Cirque Du Soleil) in April 2007, it then spent three and a half years touring North America. It then moved to Japan for eighteen months – but the crew had to be evacuated to Macau when the earthquake and tsunami hit. After returning to the US for 6 months, Kooza moved to Europe at the beginning of 2013, where it has remained ever since. Many of the cast remain with the production for years – lead singer Tara Baswani, for example, joined in April 2007 and only left in January 2013… that’s nearly six years! Kooza is a stunning show. I first saw it in California in 2009. The highlight is, undoubtedly, El Penudulo De La Muerte – the wheel of death. It elicited from the audience the most thrilled reaction I have ever experienced in any theatre, opera or circus. At one moment in the act, the entire audience audibly gasped – which is clearly audible, even over the loud music, in youtube videos of the act. But watching it on youtube doesn’t do it justice (and may not be legal anyway!) – see this thrilling act in London in the next few weeks. Kooza‘s return to London is a good time to raise the question of why there isn’t a permanent London Cirque Du Soleil show. The simple answer is – that there is no simple answer. Click to read more. This entry was posted in Circus and tagged cirque du soleil, el pendulo de la muerte, kooza, Royal Albert Hall, tara baswani, wheel of death by showbusinessinsights. Bookmark the permalink.